Facebook users on iPad have been waiting quite long for a official App on the device. Facebook has been delaying the app launch for one reason or the other. It was first expected to launch at F8 conference and later on, hopefully at its Apple’s “Lets talk iPhone” event. But it was delayed for unknown reasons. Now, It has announced on its blog the availability of App. The newly released app will be utilising the bigger screen oof the device to provide you a better experience. Some of the features of theÂ app is being listed below (via blog post, Image credits – Facebook). Use your fingertips to scroll through your News Feed. Give the screen a swipe to page through albums. Pinch a picture to zoom in. Whatever you’re up to, using Facebook on your iPad just feels fun. Photos really shine on the iPad. They’re bigger and easy to flip through, like a real photo album. It’s like having a slideshow with all your friends and memories, wherever you go. Your games, apps, groups and lists are in the left-hand menu, so you don’t have to dig around to find the stuff you use most. And your messages and notifications are at the top of every screen, so you can respond to friends and keep up with important updatesâ€”without losing your place. The app comes with a bunch of other new features: You can chat with friends right from your iPad, for example, or play games and use apps in full-screen mode. You can also watch high-res videos inline, record HD video and stream to Airplay devices. The App is now available in the App Store for you to download. 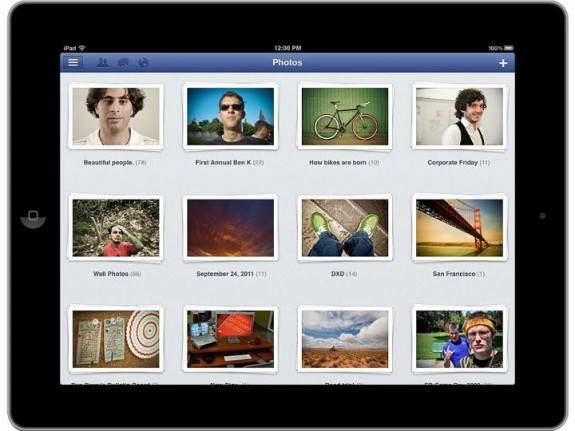 Just use your iPad, download it and start enjoying a new Facebook experience on your iPad.